Kiss Me, Fool – I’m Irish…. I love pubs. 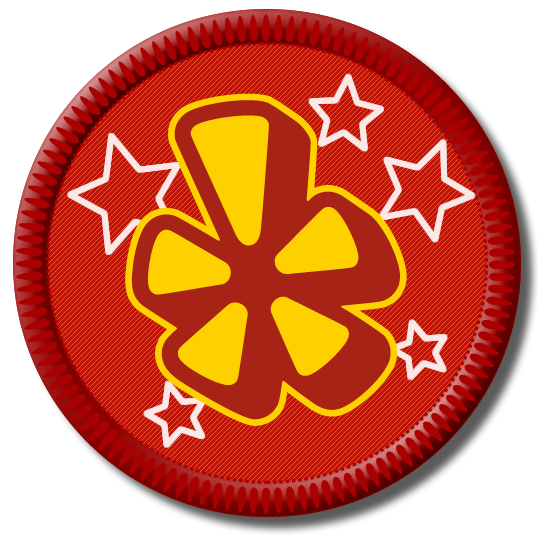 They are meant to be noisy and fun, and if the food turns out to be good, that’s a bonus. Two Fools is noisy. 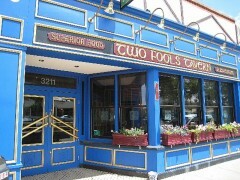 But the food is better than any other pub that I have been to in the Duke City. I really love this pub. 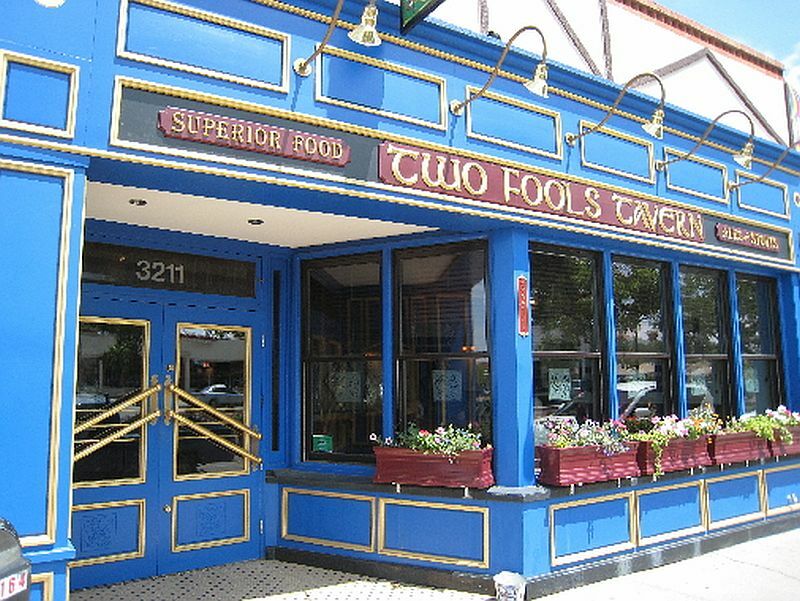 The Two Fools Tavern, an Irish Pub on Central, close enough to UNM for students and staff to walk when they overdo things. 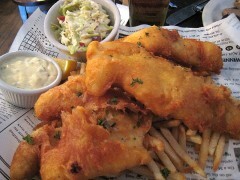 It turns out some really good pub fare, which includes a world-class Fish and Chips plate. I had that Two Fools Fish & Chips — two pieces of house ale-battered Icelandic haddock, served with chips, homemade apple coleslaw, and homemade tartar sauce (excellent). This was cooked to perfection — ithe slightly golden hue and just-the-right-crispness very tasty batter did not detract from the perfect moistness of the haddock. This is surely the very best F&C in New Mexico. 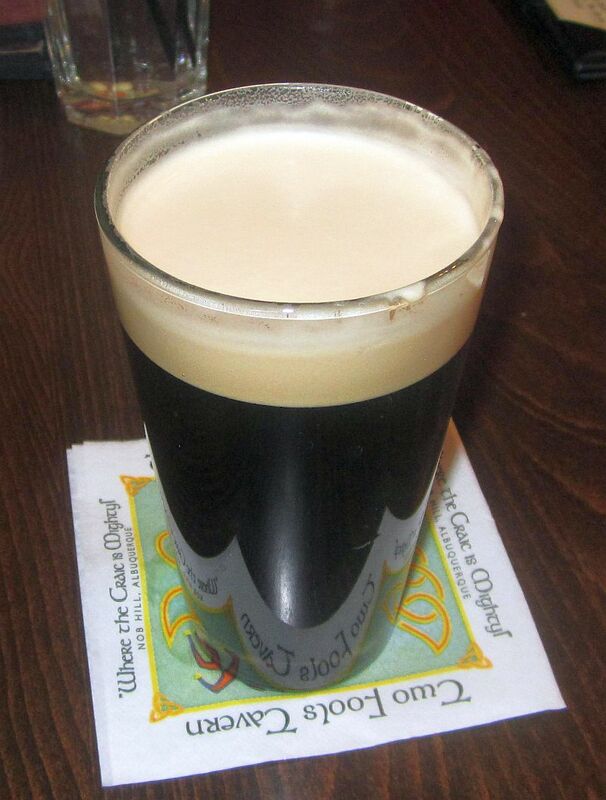 The only better I have had anywhere was at the Kings Head Pub in Dania Beach FL, one of my son’s favorite haunts. Mine, too. 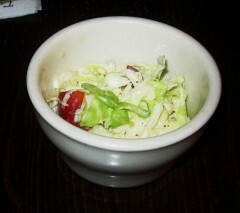 Dr Jane had Cobb Salad, a crispy lettuce, avocado, grilled chicken, bacon, and blue cheese creation. Good enough, but she won’t write home about it. Dr Martha had Cottage Pie—Angus beef simmered with onions, carrots, peas, and spices, and topped with whipped potatos and cheddar cheese. She pronounced it wonderful, and wished that the serving were slightly larger. 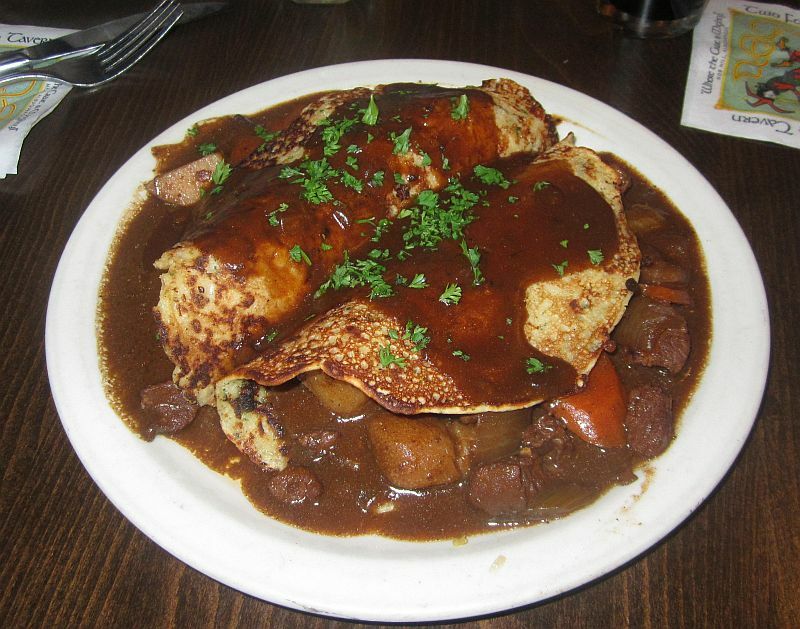 The Two Fools version of this dish has the pancakes wrapped around a very delicious Guinness Beef Stew. The savory result is a not-too-light dish with an unbelieveably good taste. I would come back for this hearty dish on any cold winter night. Have a quaff of Guinness with it. For BBQ fans, try the Babe in a Bun: Tender pulled pork simmered in Two Fools own Guinness BBQ sauce & topped with our home made apple slaw. This fine sandwich is like no other pulled pork BBQ that you will find in any Albuquerque BBQ restaurant. Two Fools puts a non-standard spin on an old favorite, and the result is quite good. The sauce is neither Texas, Carolina, Kansas City, nor anything else you may find here. It is a decidedly different and wholly delicious. Try it for a new taste treat. 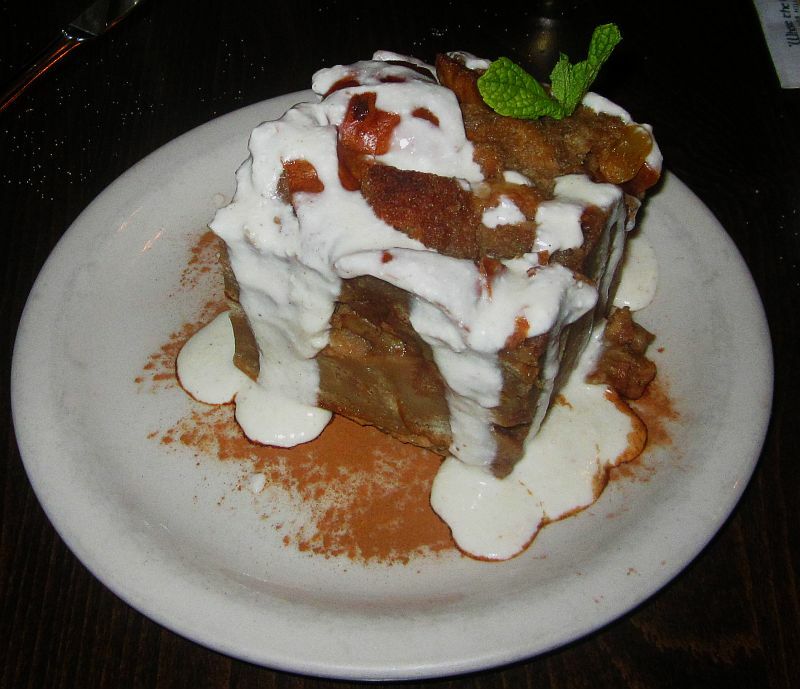 For dessert, even though my waistline doesn’t need it (but I can’t resist bread pudding), I had the house made Bailey’s Irish Cream Bread Pudding. It was easily among the very best I’ve had, but no match for a similar world-class concoction served at Barry’s Oasis. 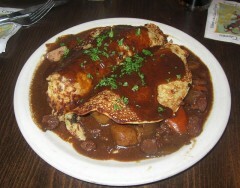 Huge portion; left enough for breakfast the next morning. My son (the one who introduced me to the Fish and Chips at Kings Head Pub in Florida) visits me often, and I will surely take him to Two Fools for a comparison. And we will need a designated driver-care to join us? “Read the table tent placards at the Two Fools Tavern and you’ll learn that this is where the craic is mighty. An old Gaelic term pronounced “crack”, craic refers to the lively essence of the pub experience, a unique and sometimes loud combination of good friends, good times and of course, good pints. “Craic is a word for which there is no exact English translation even though there are some 9,000 pubs in the Emerald Isle. In Ireland, pubs, or public houses, are a focal point of the community–as much as the local church. It’s where friends gather for camaraderie and commiseration. Gil loves the bread pudding here. “One of the best parts of living in my “on the border of the ghetto” town home, is that right on the other side of the hood are some of , in my opinion, the best places in town for food. I am course referring to the Nob Hill area. This is where I practically grew up since I attended a highschool right down the street. 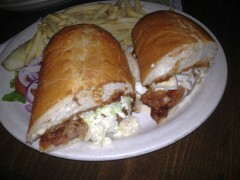 This entry was posted in Honorable Mention, Irish, Pub Food. Bookmark the permalink.